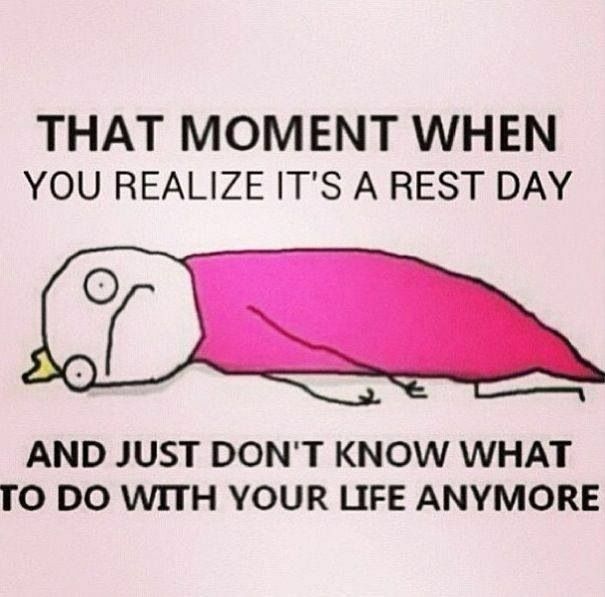 I don’t think I will stress one bit over this rest day and I’ll embrace it! I am still trying to figure out why but I am as sore today (quads, glutes etc) than I was the day after the Go! St. Louis HM back in April. I don’t think it was my nice and easy 7 miles yesterday but perhaps from the fast 1 mile on Saturday? 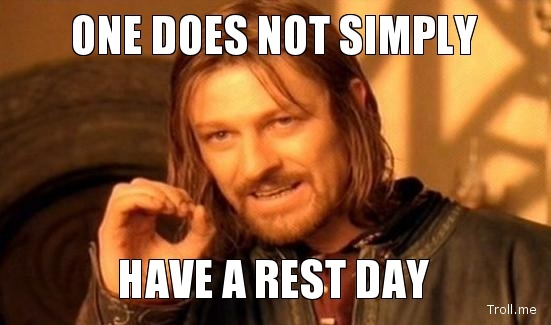 Due to soreness, I am actually looking forward to my rest day. Also, it’s blazing hot outside and the rest of the week is cooler. Hal Hidgon’s beginner (novice) marathon training steps back long run Saturdays every 3rd week. Sweat wicking clothes are the greatest invention ever! 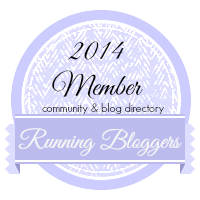 I’ve been too tired for the last couple of days to blog lately and catch up on my favorite blogs. I’ll try to spend time doing that tonight. Yesterday was a whirlwind and passed so quickly. My day started out early with a quick breakfast and the “Macklind Mile” billed as St. Louis’ fastest mile. 1500-1700 people participated. This race gets bigger each year because people and especially elite running love getting that PR. In the Elite group, you have to be able to run a 4:30 minute mile or less. I always sign up for the recreational which allows everyone to run together which includes people pushing baby strollers, dogs, children and I got a late start behind a group of stroller women. I ran the mile in 8:43 which is 10 seconds faster than last year but still, I should have been able to do better. Next year, I’ll sign up in women competitive so I can at least not stumble over strollers. 🙂 Still, I enjoyed it and was dead tired afterwards. 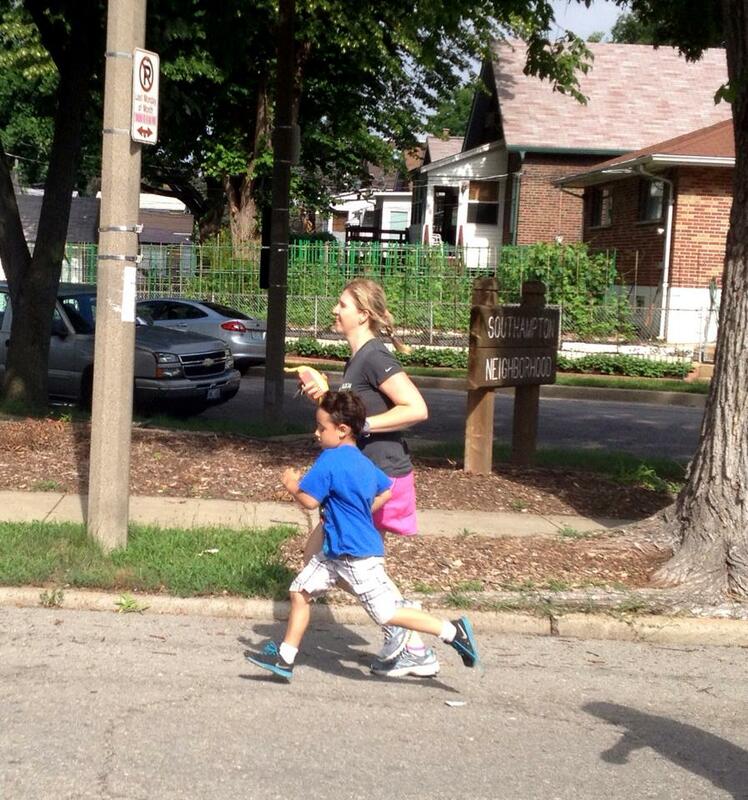 We stayed a while because I registered Daniel in the kids quarter-mile race at his insistence. He loves doing that and as you can imagine, I love him running. He didn’t get a shirt which disappointed him because they ran out of kids shirts. He’ll get one in the mail. But he did get a ribbon when he finished which made him very proud. We all went and had a nice breakfast at “City Diner” in Tower Grove. We had good conversation. That has been an issue with us. Most time except for the kids, we don’t have anything in common to talk about. But at breakfast, everyone was busy talking about exercise, running, working out and diet. That was a good day for me. After breakfast we all went to the “Soulard Market“ for fruits and veggies. Afterward, Kevin and I went to our apartment and walked the dogs, took a shower and a sweet nap! The weather in the city was so humid and I kept a slight headache all day which is unusual for me. We went later to visit Allison, James, Daniel and Sadie and Daniel came home to spend the night with us. I went to bed way before Popeye (Kevin) and Daniel did because I knew I had 7 miles staring me in the face early this morning. I could hear them laughing until late in the night. Ok, I know this is a long post and I kinda apologize but….I’m catching up. I woke up before 6am and left Daniel and Kevin sleeping. I dressed and pottied the dogs. Had an english muffin, natural peanut butter, banana and a cup of coffee with half and half for breakfast. It was warm and humid but a very nice breeze. I decided to run the city streets instead of Forest Park. I did not want to run but within a .25 mile, I felt like a little kid running. I did not look at my Garmin for over 4 miles. I enjoyed the quietness of the early morning streets and the beautiful architecture of St. Louis’ old buildings. I ran from my apartment toward downtown near Union Station. In the downtown area (about 3 miles away from my apartment) a huge weekend Pride celebration and parades were going on downtown so it was very busy and very colorful. There was a Pride 5k and I almost signed up but I needed 7, not 3.1. I made my turn around at the “Meeting of the Waters” sculptures. It may be the first time that I have enjoyed an entire 7 mile run or maybe any run. But, I took a rest day today. I took my dogs to the dog park to play in the water, I did some laundry, cleaned the house, I packed for our weekend trip to our place in St. Louis, I watched a couple of episodes of “Ghost Whisperer” (terrible actress btw) and sat outside in the backyard and had a nice glass of wine. I really hate rest days and one reason is because I can’t eat as much because I don’t burn any calories. 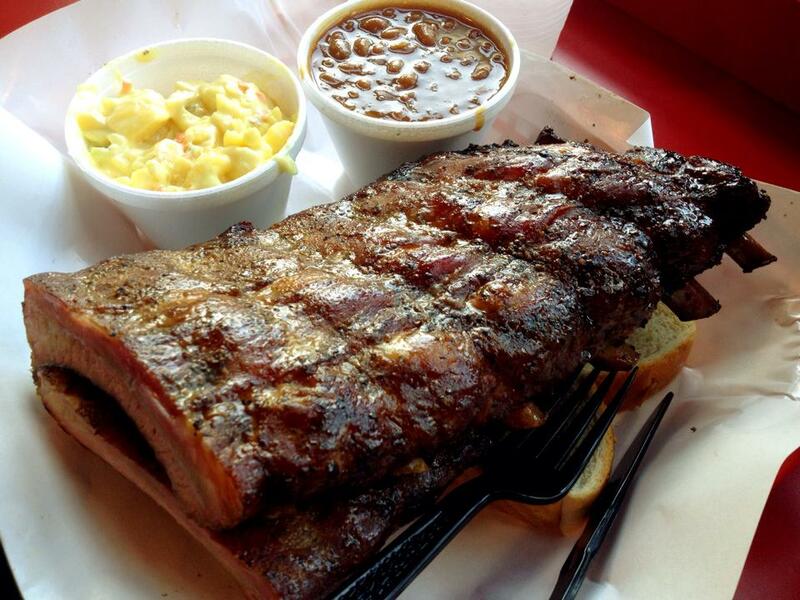 I should stop complaining about that and just learn to control the Friday “eat everything” day. I have done well (calorie wise) this week. I am worried about how I will get my 7 mile run in tomorrow on my long run day. 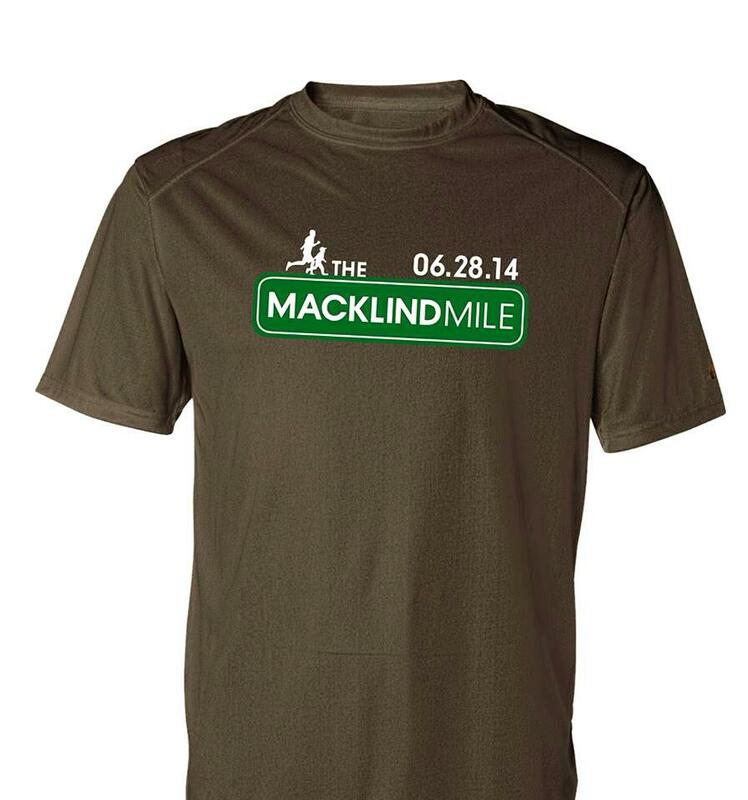 I have the “Macklind Mile” run in the morning and it’s a 1 mile speed run that is very popular in St. Louis. After that (when the temps are rising), I have to find a way to get in 7 miles which is on my training schedule. My worry is that other things will be more fun with the family and that I will not do it. I guess that wouldn’t be so bad because I can run 10 miles fairly easily and will catch it up. I just hate not being disciplined so early in my 18 week training program. I’ll do my best to get in the 7 after the 1 mile race. I just worry about the temperatures mid-day. Daniel will probably come home with us in the late afternoon and I would rather have time with him than run. But, I’ll see if I can stay on track. I guess I can do it Sunday if not Saturday. I am very much a self reflecting person. I can’t say that I’ve always been but for the last 5 or 6 years, I am brutally honest with myself. I may not always come clean with others about my flaws, but I discuss them in my head, on my runs and sometimes with Peyton and Eli. They are great listeners especially if you have a food item in your hand. They listen and drool. I am the world’s biggest skeptic..I think. Well, I know! I don’t believe most of what I read and none of what I hear. If I haven’t experienced it…..it didn’t happen or it’s not possible for it to happen. I do not believe in even the simplest of things that people believe in like aspirin, Tylenol, cold medicines, vitamin c, vitamins at all…etc. I do believe that oxycodone knocks out pain because I used it during my surgery recovery and it worked! See, I had to experience it. I watch/read National Geo, news (god forbid), documentaries and most seem inconceivable and outright not true to me. I know some people believe in God, angels, ghosts, aliens…etc…..I have to admit, I have a hard time with that because it hasn’t been proven to me or I haven’t experienced it. My husband is the polar opposite of me. It doesn’t make him wrong or me wrong…or maybe it does. I’m not spiritual….I see no real value in that. I want to be. I’m at peace most of the time with who I am and what I believe but still, I wish I meditated, prayed..etc and I could feel immediately that it made a difference. Also, I am unique in my family of brothers and sisters for being that way. They are the opposite. That is why it is hard for me to believe in things during my “marathon training” such as eating right, right balance of carbs, taking in enough water because I have not experienced that it works…right? The only thing I feel sure in re: health/diet is if you burn more calories than you eat, you will lose weight. I’m sure of that because I experienced it and proved it. It took me a while during my weight loss to believe it. I’m glad I hung in there because in the past, if I didn’t see immediate changes, I quit because I didn’t believe in it. I also know working out builds and tones muscles because it happened to me! Again, it took a while and I am still not sure why I hung in to see results but I did, fortunately for me. Again, I had to prove it to myself. Most of the time, I am impatient and don’t take time to see results or proof…which is why I got so fat. If I get down or slight depressed (which happens rarely) but I do not believe medicines help. I’m sure it does for people…so “they” say but I am a skeptic. I know running beats the blues/depression/sadness/anger….because it does for me. That presents a big issue for me while training for a marathon. They say “they”, trust in the training, eat right, drink fluids, replenish the salts, minerals etc….but I can’t visualize how that will help and I am left believing other people’s accounts which is difficult for me. When people say “they” say…..my ears tune out usually. 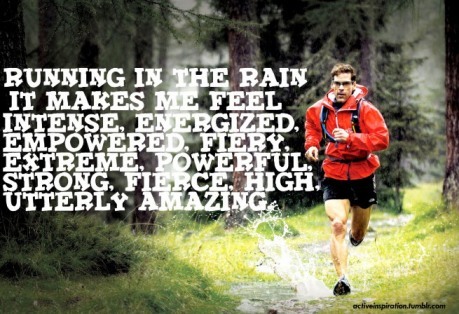 I never believed in a “runner’s euphoria/high”….until I experienced it. 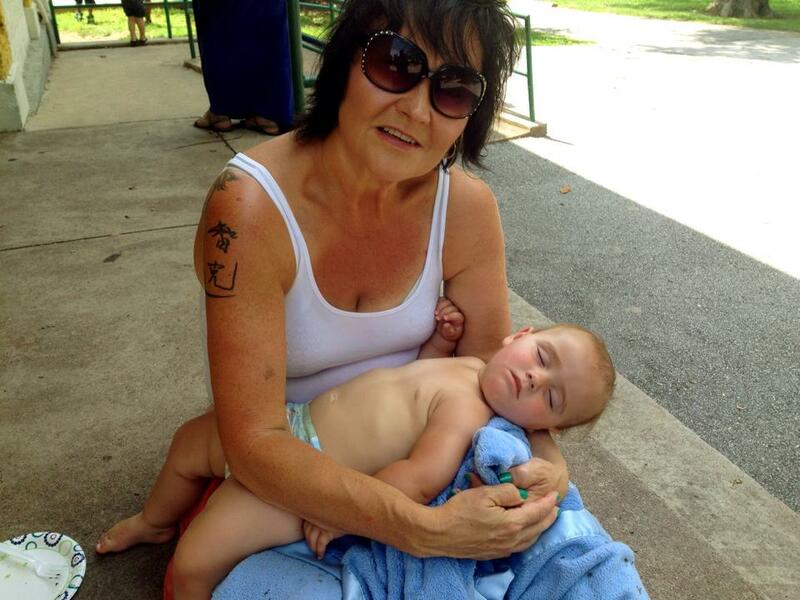 I didn’t believe that I would be close to grandkids…until Daniel was born, then Sadie. I didn’t believe I could love dogs, let alone let them live in my house…until Peyton then Eli. I’m not sure what kind of person that makes me. I do worry about that. I feel empathy, sympathy, sadness and happiness for other people but usually only if what happens to them, has happened to me or in some way or I can relate to it. When my co-worker’s dog died….I cried everytime I talked to her. I cry thinking about it. When a co-worker’s grandchild died from a horrible accident, I still can’t talk to her and not get tears in my eyes and that’s been 8 years ago…because it’s something I relate to. So, I took a long and cathartic post to say that I am having trouble staying focused on my marathon training even with crucial elements such as eating properly, hydrating correctly, training properly because it has not been proven to me that it will make a difference in the end. I know my willpower, though….and I think I will finish that marathon…even if I crawl over that finish line. 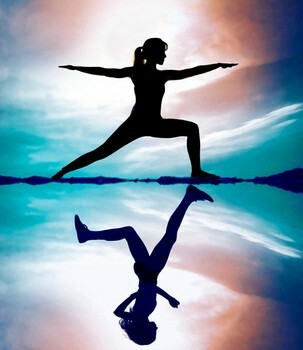 Last night, for the first time in my life, I did yoga. It was a rest night from running so I had to find something useful to do. I found a routine on a fitness page for beginner’s yoga. I think what I did was the standard and what I did find out was just how stiff and inflexible that I was. The yoga was more painful that running 4 miles. My “marathon training” schedule called for 3 miles but I ran 4.03 miles instead. My eating has been good and controlled this week so far….so there’s that. I’ve seen all of tonight’s showings of “Criminal Minds” so I’m watching STL Cardinals baseball and trying to find the energy to get up and go to bed. Where does my night go? Am I “freaking” losing my mind? Over the last 2 and half months, I’ve only had 9 days off from running. Many of those runs were over 3 miles, some 6, 7, some 8 and a couple of 10 milers. So, I rushed home yesterday and mowed and took care of my lawn so I could have a REAL day off today (Monday) from “Marathon Training.” Monday nights are supposed to be my “laying on the couch with feet up, surrounded by dogs, watching Criminal Minds night” (my guilty TV pleasure besides sports). Today, the weather is cooler (79ish) and humidity is down and all I can think about is whether I should run tonight. I have read and I know (because I am quite intelligent! HA!) 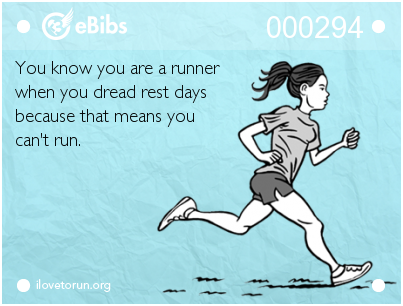 that “rest” days are just as important as the run days. But, I can’t get seem to accept that. I want “to want” to rest! At the time I am writing this, I will likely try to force myself to not run tonight. There actually is a Criminal Minds episode about runners being murdered….so there’s that! On another note, “Amish” homegrown tomatoes are in and I am smiling! 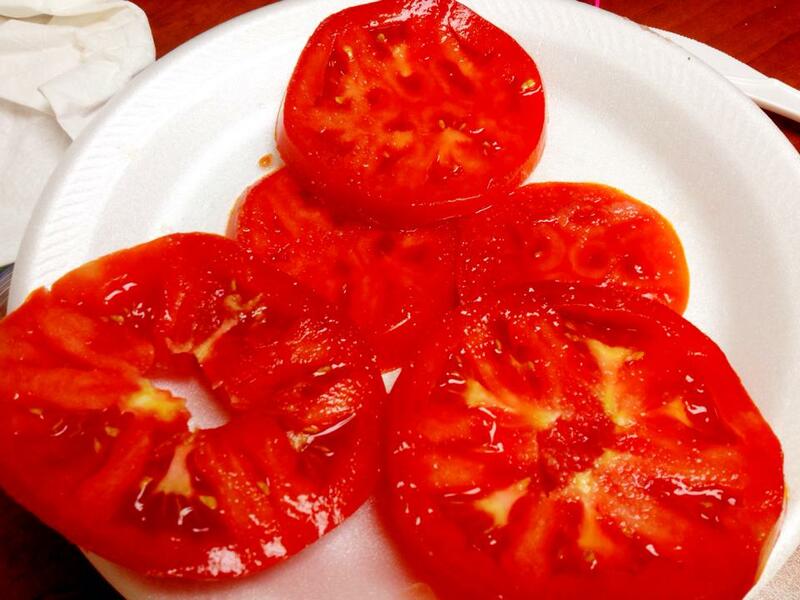 I can eat homegrown tomatoes with every damn thing that passes my lips. There may be an issue with that this year. Since I have been marathon training, my stomach is not as stable as it has been in the past without giving TMI! So, that may be interesting. 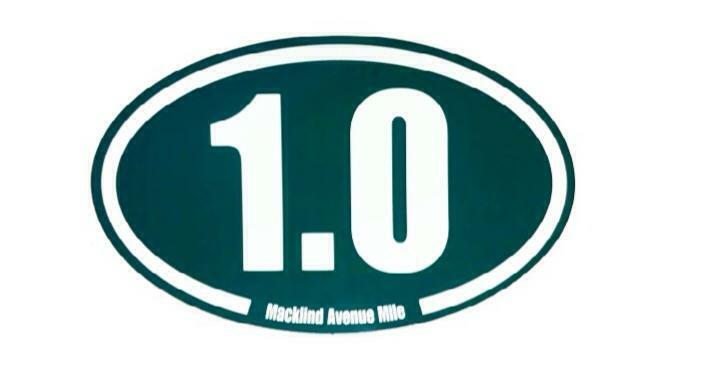 Another small interference with my regular Saturday long run day is “Macklind Mile” with is a great and fun 1 mile run that is happening this coming Saturday morning. 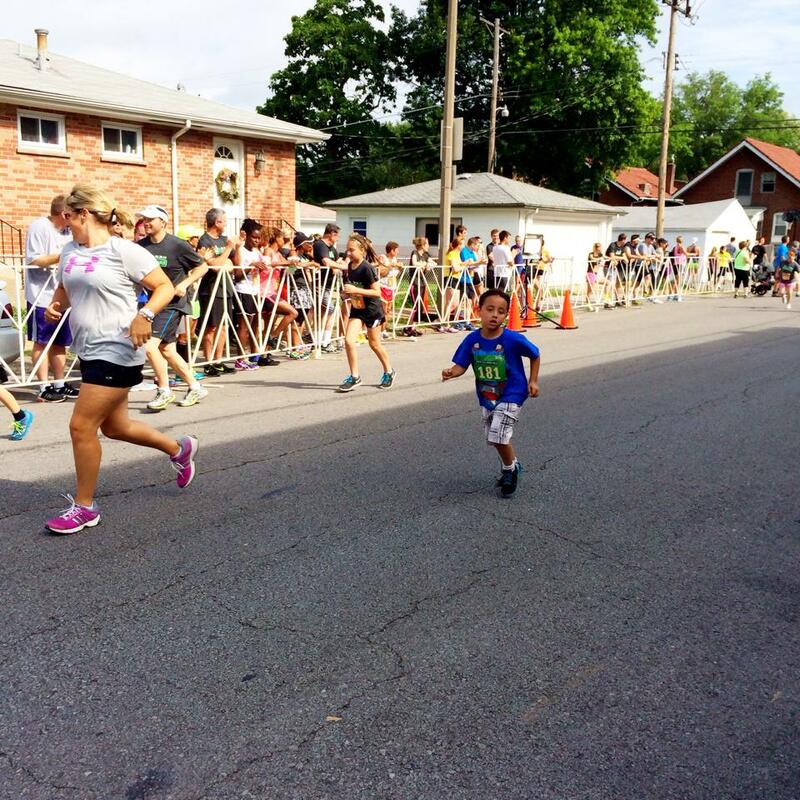 It’s noted as St. Louis’ Fastest Mile because the course drops 73 feet in elevation from start to finish with the third quarter of the race seeing the biggest drop. 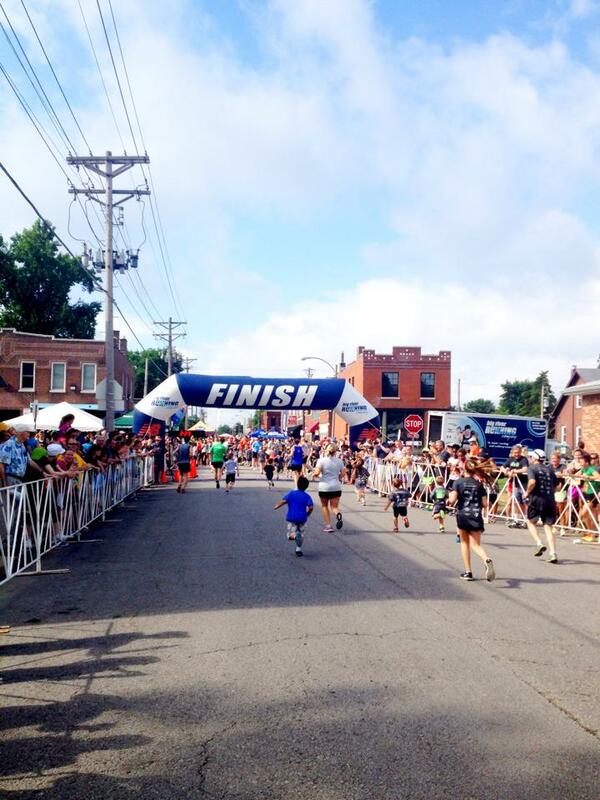 The race finishes with a roughly 300 meter straightaway so you will have to earn that fast finish! Elite runners love it and people like me love it! 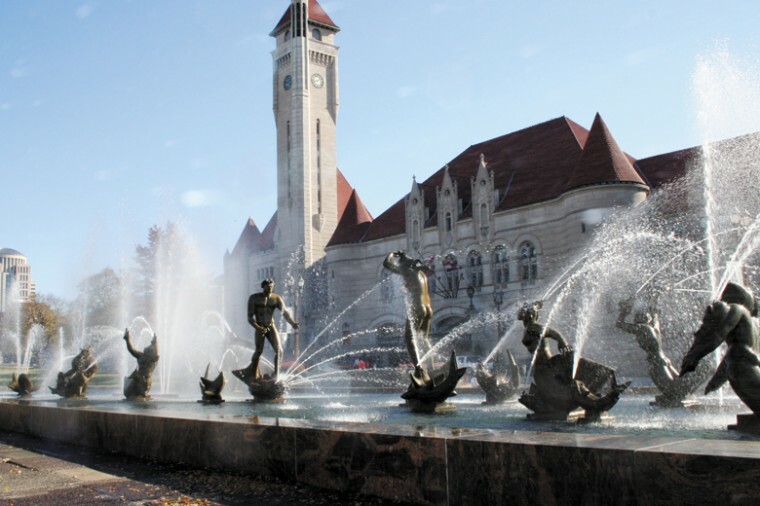 It’s very popular in St. Louis and surrounding cities. I love it when I sleep well and I have been sleeping incredibly for the last 3 or 4 nights. Last night it was storming and that’s when I sleep best. It was raining when I woke up and that just made the morning great watching the rain from our St. Louis apartment rain. It also made me want to have a short run on my day off! 🙂 I ran the streets up and down the neighborhood. I really always like those type of runs more but they are also more dangerous if you don’t watch for cars etc. It was raining fairly hard at first, then slower and then comes the sun and humidity! But it was a great run. I have run everyday since last Monday. I can’t seem to make myself not run. We came home early from St. Louis and I mowed and weed-eated the lawn so I could have a real rest day tomorrow. The lawn looks awesome if I do say so myself. I love doing yard work. Again, I hated leaving St. Louis. I always feel like I’m leaving my home when I leave. I hate leaving Daniel and Sadie so much. It always leaves me a little blue. Plus I have the Sunday night blues as usual. I ate healthy today. Kevin made spaghetti dinner using quinoa pasta and I loved it. I ate a bit too much but I need the carbs! I’m tired and very close to going to bed. Another nice and very busy weekend that I hate seeing come to an end. It has been a busy and awesome last 2 days. Last night we took Daniel to a Cardinals game. They lost. There was a rain delay so we left before the game was over. It was almost 10:30 pm before we got him home and his other granddad was there waiting to see him. I felt bad on that timing. I usually try to not interfere on other grandparents visits because they usually come from another state to visit. Kevin, Peyton, Eli and I have enjoyed our time together. The dogs usually get a bit jealous when the kids are here and don’t get enough attention. We had Daniel’s birthday party today at a local park and water area for the kids. I was worn out after it was over. Kids wear me out! They wore Sadie out too. She and I sneaked away from the others for a rest. I didn’t eat healthy today but I ate good! 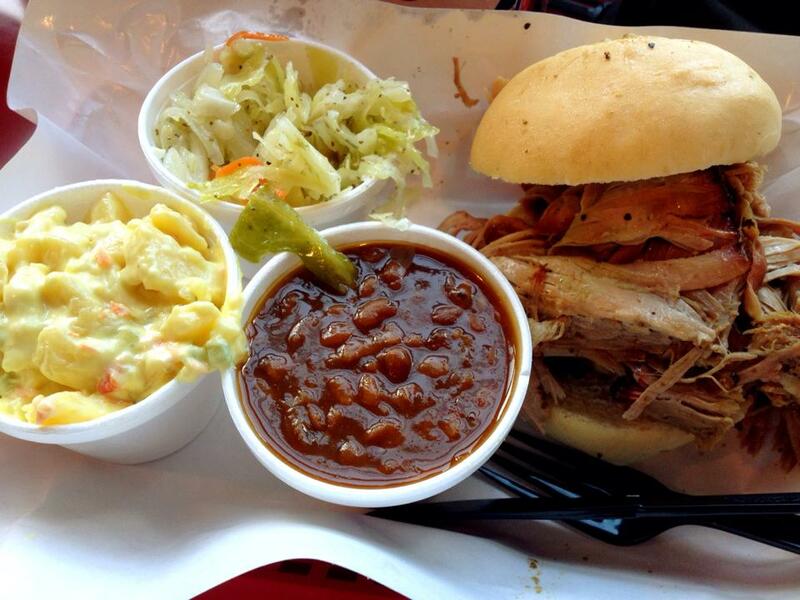 Pulled pork BBQ and the fixings just like down home Memphis! I had planned to get out a bit tonight with the dogs and exercise but it’s coming a bad storm here and lights are blinking. We may be sitting in the dark and hot before the night is over. I really have to get a grip on this bad eating but I had plenty of exercise so hoping it all evens out. This was a nice weekend for me. I got to spend good time with all the people that I love. I think Daniel liked his guitar and Sadie loved her laughing baby doll. I’ll Wine if I Want to…. I left work a bit early today to get in my run. It was raining in the town that I work in and 75 degrees. I was pretty happy thinking I could get in a quick 3 miles, shower and leave for St. Louis. I work in mid-northern part of Missouri and temperatures often vary considerably. It was not raining, humid as hell and 91 when I got home. We have an extra day to spend in St. Louis and we will enjoy it. 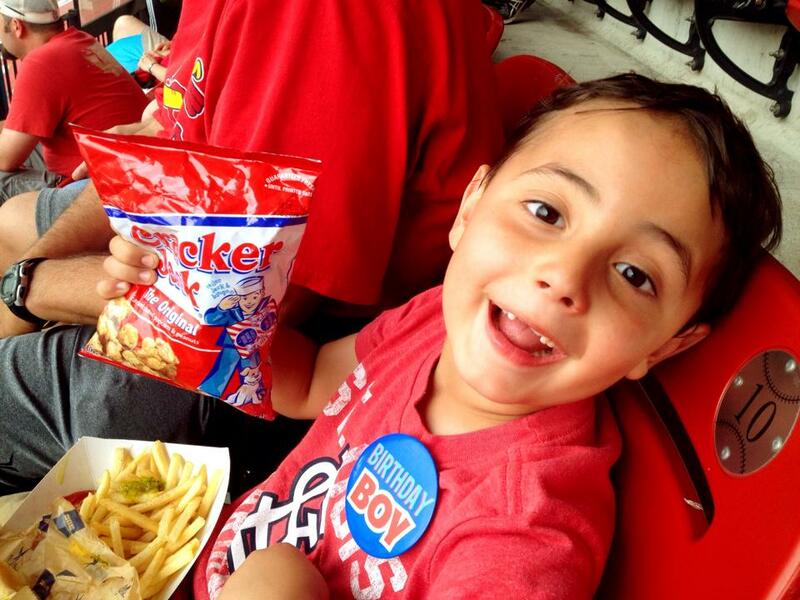 Tomorrow night, we are taking Daniel to a Cardinals game. He only likes the game off and on and the rest of the time he likes, peanuts, cotton candy, hot dogs, dipping dots and running around! He likes to go to the terrace to get his energies out (Daniel’s words). I usually sat up there with him drinking an $8 dollar beer watching him. Due to his birthday party and his “Daddy Daddy” (other granddaddy) and my ex-husband is in town, he will be spending time with him after the party on Saturday. So….Saturday night is Kevin and Charlotte night! I’ll catch a short run on Saturday and maybe Sunday but it’s going to be hot and humid in the Lou this weekend! We may cook at home and have a nice romantic dinner and in bed by 9:30pm….to sleep! That’s the story of my life. I just can’t hang anymore. When we got in town tonight, CWE was hopping and we took the dogs on a long walk. I was sweating when I got back to the apartment. A chilled glass of Missouri made St. James Strawberry Moscato was delicious on a hot night and a bit of gorgonzola cheese (my absolute favorite). Ok, 2 glasses of wine…. I’m tired and that glass of wine made my ears warm…that’s a good sign I’ll sleep well! Another hot and humid day in Mid-Missouri! Work was busy and the day passed fast and on that drive home I dreaded having to do my run the entire way home. It was a short run but so hot outside that I did in on the treadmill. I usually enjoy the treadmill once I get on it but not today. Those 3.09 miles dragged on. 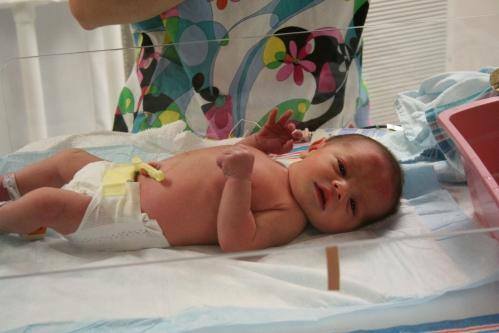 7 years ago today was the best day of my life. Daniel has given me many more best days for the last 7 years. Kevin and I are heading to our St. Louis apartment tomorrow night. I’ll get a longer run Friday morning and we are taking Daniel to a Cardinals game Friday night. He has his birthday party Saturday with family and his little friends in Tower Grove Park.